The Weather as a Coruscanti Weatherman Might Have Reported It. Okay. I think I just found my new favourite weather website. The tiny text under “Cold, ice, freezing desolation” reads: You may have to climb inside a tauntaun for warmth. It’s Hoth out here! 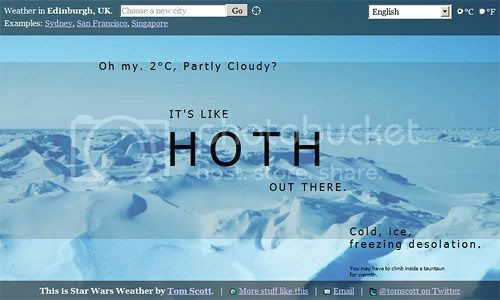 XD (Not too far off the mark, really… Although considering the temperature over the past couple of weeks, 2° is warm) No way am I climbing inside a tauntaun though. The tiny text reads: Also, bits of the Death Star might fall on your head. 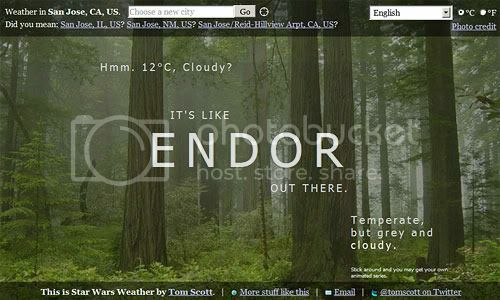 San Jose is apparently delightfully Endor-ian, albeit a bit grey at the moment. Tiny text: Stick around and you may get your own animated series. 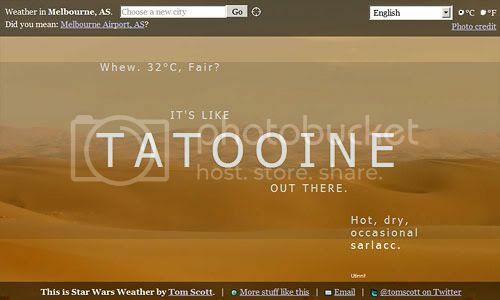 And way down in Melbourne, it’s hot as Tatooine. That can’t be fun.